Wednesday, April 2, 2014 Posted by Stefanie B. There are significant advantages to investing in an outdoor log set for your gas fire pit. Outdoor gas logs provide customers with an opportunity to enjoy a full, realistic fire without the messy hassle of ashes, soot, and other debris. Typically, they're designed so that you only have to turn the valve or flip an on/off switch, making them exceptionally simple to start. Outdoor gas log sets also tend to be much more affordable in the long run, because they eliminate the need for routinely purchasing and stocking firewood. If you're looking to make a display change in your gas fire pit or purchasing a unit for the first time, there are countless options of log sets available for your outdoor fire pit. At Woodland Direct, we have a variety of styles and sizes ready for purchase. Today, we'll focus on distinguishing between the designs of our available outdoor log sets. For more information about how to choose a gas log set, please refer to our previous blog post entitled How to Buy a Gas Log Set. 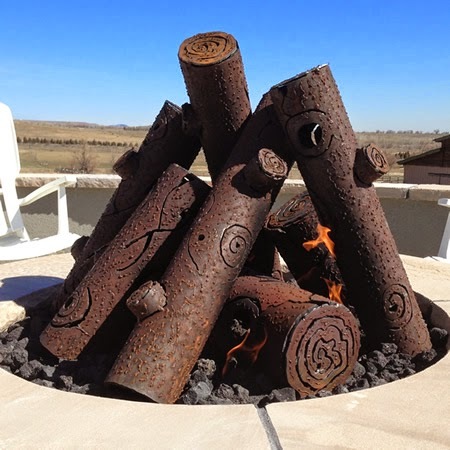 TimberCraft Metal Art specializes in creating quality artisan outdoor gas log sets produced from 100% reclaimed steel. Each log set is a one of a kind custom creation, made in the USA by skilled metal workers. Because these outdoor gas log sets are created from heavy duty steel, they'll give off the same degree of heat as an actual campfire, allowing you to enjoy your outdoor entertainment area year round. Even within the brand, there are a multiple choices and configurations available for purchase, from different size and shape arrangements, right down to style and design. These artistic steel log sets come in Collapsed Stack, Tee Pee, and Custom styles. They're also available in either 1/4" or 1/8" steel and are designed to acquire a rust patina finish over time. This natural oxidation will continue to occur over the lifespan of your product, gradually changing color over the years to shades of orange, red, yellow, or brown. Perhaps the most enticing aspect of this product is its expertly crafted cut-out detailing. Designed to either look more "artsy" or rustic, these laser cut designs will glow, steeped in fire, when lit. For more information on TimberCraft Metal Art, check out our brand spotlight. Most realistic outdoor log sets are constructed from refractory clay and mesh reinforcement before they're painted with life-like detail to resemble authentic wood logs in both their appearance and feel. These materials are specifically designed to withstand the high temperatures of your gas burner. Like artistic outdoor log sets, these products come in different sizes, shapes, and styles designed to suit your specific needs. Log sets range from 12" to 50", though custom log sets can also be ordered. Our most popular size tends to be 30" - large enough to impress, but not overwhelm. 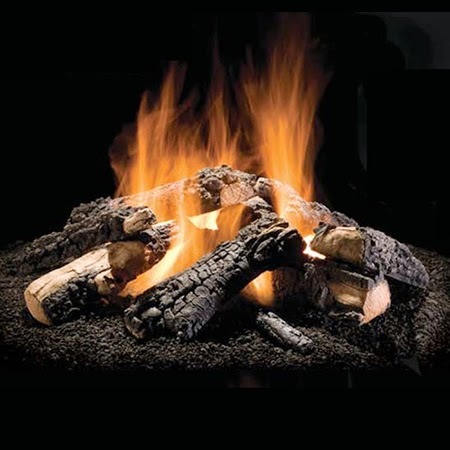 Some of our most popular realistic outdoor log sets come from the Wilderness series. The Wilderness Oak and Wilderness Charred outdoor log sets serve as prime examples of the expert craftsmanship that goes into making these products. Ultimately, when choosing between a realistic or artistic outdoor log set, the decision settles largely upon your own taste. Our artistic outdoor gas log sets create an ideal statement piece for outdoor entertainment areas, while a realistic outdoor gas log set is more a thing of understated, natural beauty. If you have any questions or want more information about selecting the perfect outdoor gas log set for your fire pit, contact one of our NFI-certified professionals at 800.919.1904. Tell us what you think in the comments!